A former Customs and Police Officer, Andrew Hill is just putting the finishing touches to the first book in a crime series set in the New Forest, where he lived for 30 years. An avid reader across the crime genre and regular at Crimefest, he now lives in West Sussex and works in property. 18 months on from the ‘Ragdoll’ murders, when a man is found hanging from the Brooklyn Bridge. Someone has carved the word ‘Bait’ across his chest. The New York City Police see a direct link with the ‘Ragdoll’ murders and send FBI Special Agent Curtis and CIA Agent Rouche over to London to confer. When our US Agents visit the incarcerated ‘Ragdoll killer’, a riot ensues and the killer’s body is hung up with ‘Puppet’ carved on it. Could it be that there is a Machiavellian hidden figure, or cult behind the original killings? Recently promoted DCI Emily Baxter teams up with the Agents and is sent to New York to investigate. When fresh killings with similar Modus Operandi occurs on both sides of the Atlantic, it appears that these grotesque murders are being orchestrated, planned and could lead to something even more ominous. So it is up to DCI Baxter to return to London, with Agent Rouche in order to avert a major incident. The author doesn’t sacrifice detail for pace at any point, peppering the narrative with well-defined characters to create a hypnotic reading experience. Rouche and Baxter in particular are absorbing, as their frailties are revealed almost in slow-motion and you begin to get an insight into why the damage life has inflicted on them, has made them ‘who they are’. Can they discover who is behind these increasingly bizarre killings and can they stop the mass event in London? 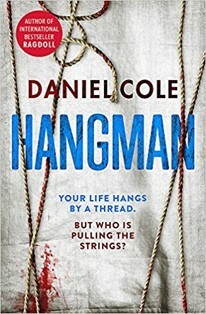 Well, all of the above is deliciously revealed in Daniel Cole’s follow up to the much praised ‘Ragdoll’ and like it’s precursor - I’d highly recommend it.